The house stands alone near a creek and is surrounded by forest. Traditional German style house. Ideal conditions to have rest in the country and at the seaside for those who care for health and wish to use natural health medicines in an environment-friendly farm engaged in herbs. There are two rooms, situated on second floor with shower and lavatory. One room is for three and the other for four persons. It is possible to rent one room or both rooms. Guests are offered ecological tea. On weekends healing holidays with herb teas and recovery baths are organized. 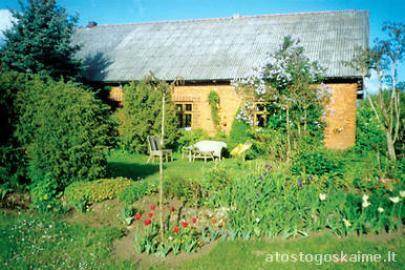 Consultations of specialists-naturapatists and folk medicine recipes are provided.